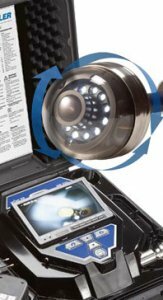 The WOH001V-340 Visual Inspection System is an advanced camera systems sheds light in the dark. The articulating eye of the full color camera head lets you take a close look at pipes, air ducts, chimneys, vents, cracks, welding seams, gaskets and manholes. The super bright wide side screen TFT monitor provides brilliant picture quality. The WOH001V-340 waterproof 1 1/2" camera always fits. With its 180° pan- and 360° tiltable camera head, it gives you an inside view into drainage pipes, air ducts and intermediate ceilings. The innovative design of the WOH001V-340 provides super bright lighting and simple operation, all in one heavy duty carrying case. A crystal clear picture appears on the wide screen TFT monitor so you identify problems before they occur. TThe camera head is 360° pan and 180° tiltable. This maximum mobiltiy allows the lens to inspect the smallest defects in the pipe without struggling with positioning. The Camera head measures 1 1/2" (40mm) diameter and 2 1/3" (60mm) in length. Fully encapsulated, waterproof camera head with exchangeable dome. Digital Distance measurement with resolution of 0.05 ft. The new recording function allows the user to save and replay movies of the inspection on a 2GB SD card. 90° bends are easily negotiable for the camera. Pipes bigger than 125mm can be inspected with the help of guidance sets.